2.5 oz toothpaste, finger brush, long reach double sided toothbrush, storage pouch. 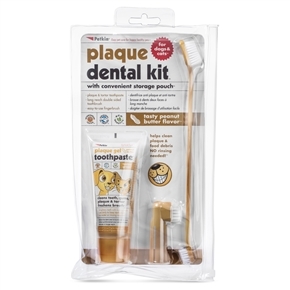 Plaque & Tartar Gel Toothpaste is formulated for dogs and cats, no rinsing required, formula cleans plaque and tartar accumulation, helps clean teeth and fights bad breath. Long Reach Double Sided Toothbrush has a long reach handle for hard to clean teeth, small and large head for plaque and food cleaning. Easy To Use Fingerbrush gently removes plaque, food debris and massages gums, easy-to-use, just slip over finger, ideal for puppies and kittens. Toothpaste Directions: Apply a small amount of toothpaste on toothbrush or finger brush. Gently pull the lips and cheeks up to expose teeth and gums. Begin brushing with short back-and-forth strokes. No water or rinsing required. Use daily for best results. Safe for puppies and kittens 6 weeks and up. 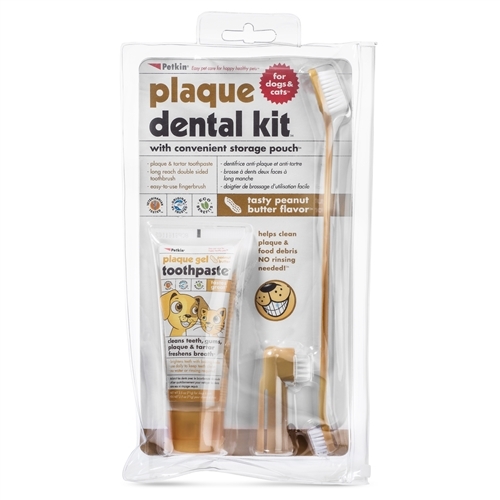 Plaque Dental Kit- Peanut Butter with convenient storage pouch. Very good product although the brush could be a little bit softer.